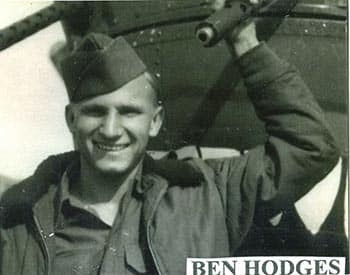 Born in Mississippi in the 1920s, 92-year-old Ben Hodges grew up in Memphis, Tennessee, but when he graduated high school there was really only one option to pursue ... his country had been brutally attacked months earlier at Pearl Harbor by the Japanese. Between 1941-1945, 11.5 million American men were drafted into the United States Armed Forces to answer the call to face down the greatest threat the world had ever seen. Hodges was one of those men, eventually being stationed in Italy. "I was the nose gunner on a B-24 bomber," Hodges, now a resident of Conservatory at Keller Town Center in Texas. "We were stationed in Italy, but we were bombing all across Europe during the war. We had some pretty tough times, but I did make it back. The pilot I went over there with didn't make it back." For the uninitiated, the Consolidated B-24 Liberator remains to this day the most-produced American military aircraft ever. Striking from Italy, the US rained hellfire down on the Allies' enemies with .50 caliber M2 Browning machine guns in addition to the aircraft's payload of 1,000-pound Azon guided bombs. But for all of the harrowing escapes that Hodges and his fellow soldiers endured; for all the times he thought he might never get back to the ground safely, much less back to his home in Tennessee, he realized much later on what true fear was when his beloved wife began the fight of her life against cancer. "My wife was sick for about two years before I moved down here. She had cancer and she had back problems," Hodges remembers with distinct emotional clarity. "When she passed, I lived by myself for about 1-1/2 years. I didn't like that. I can't cook and all that, and I really stopped enjoying my life." Hodges had lived in Memphis for more than 50 years. After he got out of the service following the culmination of World War II, he had gone to college at Mississippi State University, graduated, and worked briefly for a firm that built trailers before finding a home with Memphis' municipal natural gas company. Working with natural gas in his hometown became Hodges' career, and he and his wife raised two children - a son and a daughter - as life carried on. With no family left in Tennessee, Hodges finally began listening to his daughter, a resident of nearby Southlake, Texas, when she initiated talks with him about moving to the Lone Star State, specifically to the Conservatory at Keller Town Center. It was pretty much a big adjustment, you're scaling way down. It's a lot different, but it's not bad because you have a lot of people and great food," Hodges, who is about to celebrate his one-year anniversary as a resident, says. "There's people from just about every state in the Union, so there's lots of friends and people you can talk to, and there's always something to do." "I love that I don't have any major bills to worry about and I always have a place to eat. I used to play golf all the time in Memphis, and I'm planning on getting back out there when the weather cools off." At age 92, Hodges is one of the only links enthusiasts around with a legitimate chance to shoot his age on any given 18 holes. Family and freedom have always been mainstays in Hodges' life, and he's pleased to be able to enjoy both of them while calling Keller home. "My daughter lives about two miles from where I live and I can go see her anytime I want," Hodges says. "You can do anything you want to just like at your home, go out, even get a job if you want, although that's not something I'm currently in the market for!" Hodges doesn't let his advancing age have the slightest effect on how he lives his life. He uses the Conservatory's robust exercise area on a near-daily basis and heads for the gaming rooms when he needs to liven things up. "A lot of people play cards, and I play a little bit, but my game is pool. I've made a good friend here from South Dakota, and we play pool a lot. It's a great way to relax and talk to other people, get to know them and learn about their lives." And perhaps best of all for a man who thought his life had ended the day his wife passed away, there's the feeling of home and family, with his children, and two granddaughters - both students at Texas A&M University - able to visit any time they like.